The bandoneon (development of the concertina) is an instrument very much associated with Astor Piazzolla, it was the composer's chosen instrument and features a lot in his music and Piazzolla even wrote a bandoneon concerto. But his espousal of the instrument has led others to it as well. This new disc features a Double Concerto for Violin and Bandoneon by the Argentinian bandoneon player and composer JP Jofre (Juan Pablo Jofre Romarion). Commissioned by the violinist Michael Guttman, it is played on the disc by Guttman and Jofre with the Orpheus Chamber Orchestra. As well as the concerto, we also get three short duets for violin and bandoneon by Jofre. The concerto is in three movements, an 'Introduction' leading to 'Allegro', 'Adagio' and then a cadenza leading to 'Milonga'. Inevitably, the ghost of Piazzolla hovers over the work, how could it not. After all, as well as playing Piazzolla's instrument, Jofre also studied with Julio Pane who had played bandoneon in the Astor Piazzolla Sextet. Perhaps Jofre's style is somewhat more lyrical and ruminative than Piazzolla's, there are dance rhythm hints here but Jofre takes quite a fluid view of rhythm and structure. His concern for balance between two very different instruments, and the string orchestra, has led him to write quite an intimate piece (in fact, I did wonder how it would work as a sextet). The two solo instruments often duet together, and the big set piece moments dissolve into intimacy. Besides Argentinian dance music, I also found hints of neo-classicism. And Jofre's treatment of the bandoneon, in a classical context, rather reminded me of early 20th century pieces featuring the harpsichord, particularly the way Jofre uses the instruments particular timbre. The bandoneon very much provides an interesting sense of texture, and it is this feeling for texture which characterises much of the disc. The three duets which conclude the disc rather continue the mood of intimacy, with just the two soloists exploring how the two contrasting instruments can come together. 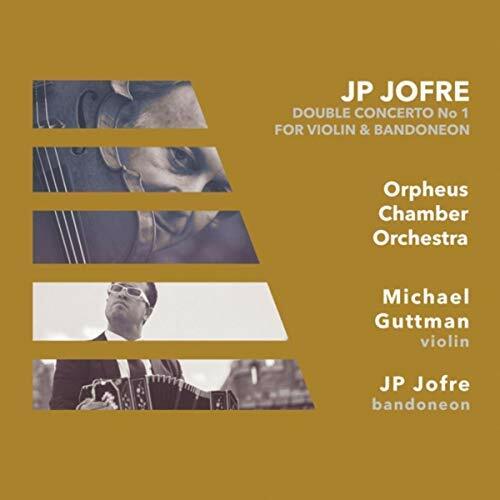 Guttman and Jofre are ably supported by the Orpheus Chamber Orchestra, and this makes a most intriguing and imaginative disc. Double concertos for violin and bandoneon are hardly likely to become common, but this one makes a striking addition to the repertoire. The disc gives the concerto the title Double Concerto No. 1 for violin & bandoneon, so we must hope for number two at some point!